We found this recipe on Canadian Living. "In this Peruvian-style dish, we've used B.C. halibut—which has a firm yet moist white flesh—for a West Coast spin." In ceramic or glass bowl, mix together fish, Thai pepper, corn, red onion, lime juice, orange zest, orange juice, ginger and salt; cover with plastic wrap. Refrigerate, stirring occasionally, until fish is opaque throughout, about 30 minutes. Sprinkle with cilantro before serving. Test Kitchen Tip: Mix the ceviche in a ceramic or glass bowl. The acid in the lime juice, which "cooks" the fish, will cause a metal bowl to react, imparting a metallic taste to the halibut. We found this recipe on Cooking Classy. "This Skillet Seared Salmon with Garlic Lemon Butter Sauce is one of the easiest tastiest dinners you can make! 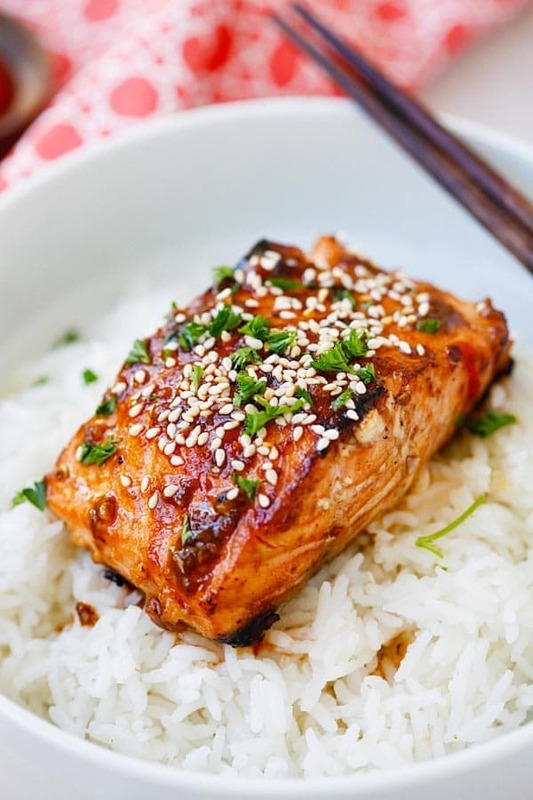 This salmon recipe requires minimal ingredients and it comes together so quickly and the flavors are oh so delicious!" We found this recipe on Cafe Delites. 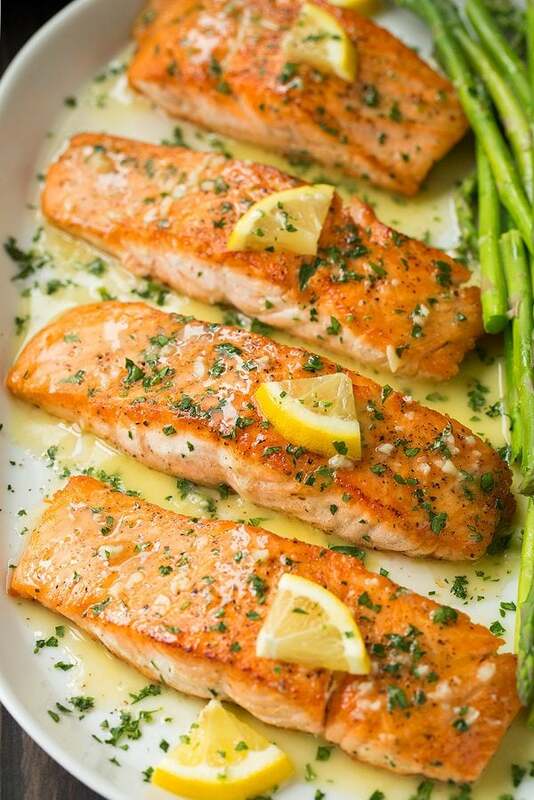 "Sheet Pan Garlic Butter Baked Salmon with crispy potatoes, asparagus and a garlic butter sauce with a touch of lemon. A complete meal on one tray using minimal ingredients you already have in your kitchen! Full of flavour and so easy to make!" We found this recipe on A Gouda Life. "Pan seared salmon topped with a creamy cucumber-dill sauce made all in one skillet. Simple enough for weeknights, elevated enough to entertain with." Using an oven-safe skillet, drizzle olive oil into the pan and warm over medium heat. Pat moisture from salmon using a paper towel and season with salt and pepper. Sear the salmon on both sides (if your salmon has the skin on, sear only on side w/o skin) then squeeze the juice from one lemon wedge over the top of the salmon pieces. Bake the salmon 6-8 minutes or until it is firm and cooked through. Remove the salmon from the pan onto a serving platter and on top of the stove over low-medium heat, add the milk and cream cheese to the same skillet then season with salt and pepper. Using an 'S' motion, combine 1/4 cup of the skim milk and cream cheese (if the mixture is too thick, add more milk one tablespoon at a time). Turn off the heat and stir in the diced cucumber and ONE tablespoon of the fresh dill. Spoon the creamy dill sauce over the salmon filets. Garnish with the additional dill and serve with a lemon wedge.